The functions Set-dvSwPgvMotion and Set-dvSwPgFTLogging have been added. They allow, respectively, to set vMotion and Fault Tolerance logging on a VMKernel portgroup. 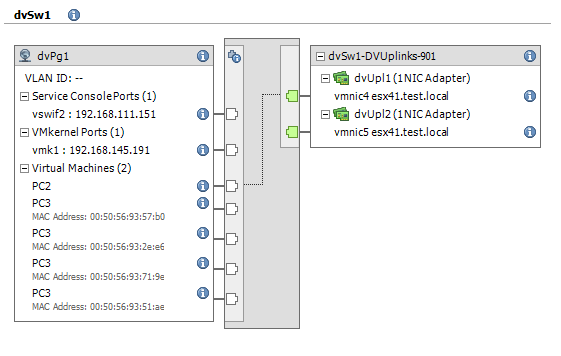 The Service Console and the vmKernel portgroups will have to be created on each ESX host that is connected to the dvSwitch, separately. Or you can create these portgroups on one ESX host and then use a Host Profile to push the configuration to the other ESX hosts. To create these two portgroups I will use the AddServiceConsoleVirtualNic and the AddVirtualNic methods. Upon closer examination of both methods it is obvious that they both use the same parameters. Only the name of the method changes. This allows me, like any good administrator ;-), to use the path of least effort and write one function to do the work and one “wrapper” functions for each of the two methods. Line 1: the function Get-dvSwitch already appeared in Part 2 of the series. Line 17: this is actual function that creates the Service Console portgroup or the vmKernel portgroup depending on the value of the $method parameter. To recap, this is the schematic view of what we have on the dvSwitch after the end of Part 3. In the next part I’ll be looking at NIC Teaming and some of the policies that can be used on a dvSwitch and it’s portgroups. If there are any dvSwitch-related scripting questions please let me know and I’ll try to take it up in one of the future posts in the dvSwitch series. Would you please help me to add an already used nic of a host in DVS. When we create new DVS it doesn’t show any busy/used nics. But when we do, add host… it shows even the used nics which are part of other VSS or DVS. Your work helped me lot. I am not able to find the way to live migrate vmkernal nic from std switch to dvSwitch with powercli. Can it be possible with powercli without dvswitch cmdlets. Hi Rajesh, no sure what you mean by “… without dvswitch cmdlets“. To manipulate a dvSwitch you will have to use the PowerCLI dvSwitch cmdlets or call the dvSwitch API directly. Love your work. A question about the function to create a VMkernel virtual adapter … how does one enable VMotion on the resulting vmkernel interface? I have added 2 new functions to enable vMotion and to enable FT logging on a vmKernel portgroup. Thanks Luc! Worked like a charm! If $config.proxySwitch.spec.backing = $null it will delete the current nic. But when I try to hand it a string with the nic I want I get an error. I know I am not formatting spec.backing correctly — it does not want a string. But I am not sure how to point it to the vmnic (or vmnics) that I want to assign. I am sure there is a better way to get $hostnet as well. The next part in the dvSwitch series will cover NIC teaming. I will add some functions for adding and removing pNICs. Good idea btw. Should be published in the coming days.